Event preview by Charles Cassady, Jr. Anyway, I always felt a little bad that some patrons might have shown up for THE TROUT in some snooty Woody Allenesque cinema dive in Greenwich Village in their waders and rods and reels expecting to get some great fly-fishing tips, only to be subject to hours of psychosociosexual French drama. That can’t happen (I don’t think) at the Cleveland Museum of Natural History on Friday, February 3. That’s when the Museum’s resident Trout Club welcomes nature writer-photographer-filmmaker and fishing guide Jim Klug, from Montana. 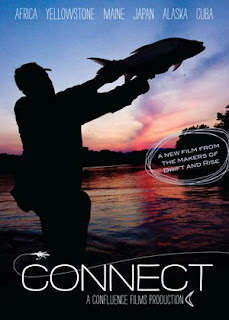 Rather than just sleep his way to the top like a French melodrama heroine, Klug and his associates in the outdoor-game arena have produced films such as DRIFT and RISE, about extreme fly-fishing in scenic locations around the world. His latest, CONNECT, goes from Alaska to Africa in spotlighting some of the rarest of river monsters, such as the tigerfish and the Yukon pike, and the fish-obsessed folk who pursue them. The evening costs $10 for CMNH members, $15 for nonmembers and only $5 for high-school students. Tickets can be reserved by calling 216-231-4600 ext. 3278 or registering online here. For more on CONNECT go online to www.confluencefilms.tv.